Come Browse In Our Conveniently Located ...5,000 Square Foot Multi-Dealer Antique Shop! 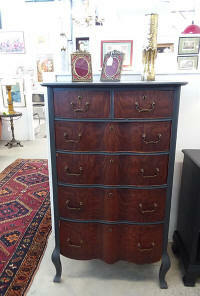 Tall 6 Drawer Dresser, Oak With Painted Sides And Top. With Painted Sides And Top.